What would you give to have a rare family heirloom over 650 years old? What would you give to keep it in the family? In truth, every Maclean does have such an heirloom. We are one of the few clans that can visit our ancestral home and walk where our ancestors, the sons of Gillean, walked so many centuries ago. We lost this precious heirloom in the late 17th century when the Chief forfeited the Castle to pay off the family’s debts. Without constant maintenance, our home quickly fell into ruins. In 1911, the current Chief’s great-grandfather, Sir Fitzroy Maclean, bought back Duart Castle and personally invested in restoring and preserving the castle to serve as the Chief’s home and a touchstone for members of Clan Maclean. 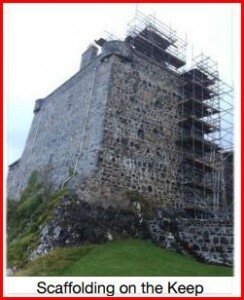 Now we are in danger of losing Duart Castle again. When water damage brought down four ceilings in the winter of 2013-2014, our current Chief realized he could no longer afford the upkeep of the castle that his family had personally financed for over 100 years. He is now urgently appealing to his clansmen to help save the castle as every year water continues to erode away centuries of Maclean history. Whether or not you take your opportunity to stand on the centuries-old stone floor where the sons of Gillean stood, it is up you to make sure th at your grandchildren have that same opportunity. What will you give to keep your family heirloom for generations to come? Learn more about the castle and it’s history at the Duart Castle website and on the Duart Castle Facebook page. Thank you to all who have contributed amounts large and small to this effort! Phase 4 is on target for completion in the early summer of 2018, and at the moment we are within our budgeted cost, however we do have a shortfall of funds from the Appeal to match the funding given us by Historic Environment Scotland. Phase 4 is concentrated on the Sound of Mull elevation, Keep gables (which are to be harled), North Wing gable, chimney, repairs to the Sea Room windows and timber work, along with considerable amounts of roof work and lead work. Work will also include internal plaster-work, and the replacement of rainwater gutters and down pipes. This work is important not only to Duart Castle, but to the future of restoration and conservation work. So much of the work requires very specialized techniques that have been handed down for generations. These skills are in danger of being lost to history. 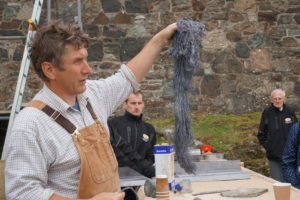 Your donation to help restore and conserve our ancestral home gives young craftsmen an opportunity to learn techniques that they can apply to historic structures throughout Scotland. Thanks to the generosity of Clan Maclean members (and non-Macleans too! ), some headway is being made to protect our home. Some of the work needed has been completed; however, there is still a long way to go.